SOS Children's Villages has been fighting to make a difference for vulnerable children in this troubled corner of the Democratic Republic of Congo since 1989. The crowded city of Bukavu lies close to the Rwandan border in the eastern part of the Democratic Republic of Congo. It is the capital of Sud Kivu province and is situated in a beautiful location on a hillside overlooking Lake Kivu. However, beneath the idyllic setting lies one of the most violent and conflict-filled areas in recent history; a region that has witnessed horrific actions at the hands of other humans and which, outside of the cities, is still considered a dangerous place to travel through. Different militias continue to spread fear and violence on the roads and in the countryside. Some of these militias also originate from neighbouring Rwanda and Uganda. Poverty is omnipresent in Bukavu, where the lack of suitable space to build houses is turning the growing city into a very over-populated place. Throughout the many years of conflict, women and children in particular have been suffering, and the number of children left to fend for themselves is alarming. For decades, numerous children in the region were forced to become child soldiers, and the traumas experienced by those who survived it make it a difficult task to reintegrate them into society. When left to fend for themselves, many children have no other means to get food than to beg, do petty jobs or become involved in crime and prostitution. The troubled past decades have also made it difficult to fight the spread of HIV/AIDS, which is increasingly threatening parents’ ability to adequately care for their children. Many children have themselves become victims of HIV/AIDS. SOS Children’s Villages has been operating in Bukavu since 1989, and the number of children without care or at risk of losing parental care remains distressingly high. In recent years, our organisation has been intensifying its efforts to help and strengthen families at risk of breaking apart, in order to give more children a chance to stay with and grow up in their family. We also work hard to find and support solutions for the numerous orphaned children or those without adequate care who can’t find a home in one of our SOS families. Until the region experiences some sustainable development and stability, the need to find solutions for vulnerable children will remain immense. The population continues to expand in the Democratic Republic of Congo, and it is estimated that close to half of the population today is below the age of fifteen. The best place for a child to grow up is in a family where they are loved and respected. That is why it is a priority for SOS Children’s Villages to strengthen vulnerable families. Up to 150 children without anyone to care for them can find love and care in one of 15 SOS families in Bukavu. Here they are secured access to school and later vocational training or higher education. As children from SOS families grow into young adults, they move on to the SOS Youth Programmes, where they learn to become independent as they complete their education or training. It is important for us to follow and support the young people as long as they need it. SOS Children’s Villages in Bukavu provides a wide range of services for the local community as well as the children in SOS families. The majority of children in the kindergarten and primary school run by SOS Children’s Villages come from the local community. Here, the children are given the opportunity to experience a good learning environment – something that is not widely available in the area. At the SOS Vocational Training Centre, young adults from SOS families, as well as adults from the community, have a chance to acquire skills in trades such as masonry and carpentry. Training in office-related work is also offered. The SOS Medical Centre in Bukavu treats thousands of people yearly and provides local women with a place to give birth in the presence of a professional staff. 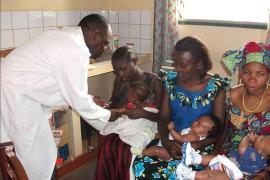 The medical centre also runs many campaigns and seminars on the prevention of HIV/AIDS. Through our social centre, we seek to strengthen vulnerable families in Bukavu and help them to become self-sufficient; this can be through small loans, by offering training that will enhance the parent’s or carers’ chance of a job, or sometimes by providing food packages and medicine. By providing kindergarten and schooling for the children, we enable parents to attend their work knowing that their children are well cared for. Furthermore, the education and skills of the children will help them and their families to achieve a brighter future in the long-term.